When it comes to choosing ways to increase your bottom line and improve your chances for success, choosing a CRM, is one of the most fundamental and useful tools you can invest in. A CRM, or client (or customer) relationship manager is a software that is set up to help you streamline your business, so you're not spinning your wheels, while you're spinning in circles. A CRM is more than a database of contacts or leads; it's a multi-dimensional technology and strategy that allows you to communicate and interact with customers in new and unique ways, all while being tracked and managed within a single database. Choosing the right CRM helps you create, and close more opportunities, while also helping you better align your sales, marketing and customer service teams. No matter where your company's focus lies, the goal is to get customers and keep customers. The way to achieve this goal is through effective sales and streamlined business processes. Sales are the lifeline of all businesses. The more time your team can focus on finding new deals and keeping them in the funnel, the better it will be ffor your company down the road. With the right customer relationship management software, there is less time is spent trying to decide where to focus your sales efforts and more time spent cultivating leads and closing deals. A CRM keeps all of your data at your fingertips and aligns your sales, marketing and customer service teams, so business has consistency throughout the entire customer experience. The advantage of using customer relationship management software is that your client information doesn't just sit static on a spreadsheet. Instead, it becomes a complete customer profile and a comprehensive 360 view of every interation you (and your brand) have had with that customer. A CRM gives real-time tracking on interactions like purchases, engagements, emails opened, clicks, website visits, as well as any correspondence your company has ever had with your client. Being able to follow every aspect of your client's experience with your business makes developing and executing more effective marketing strategies, as well as customer service policies that much easier. Having this full profile of customer/client data helps you make better decisions regarding how and where you market, your messaging and much more. Streamlining your efforts to fill the funnel from the top, while keeping the people that have already been funneled in, coming back for more. 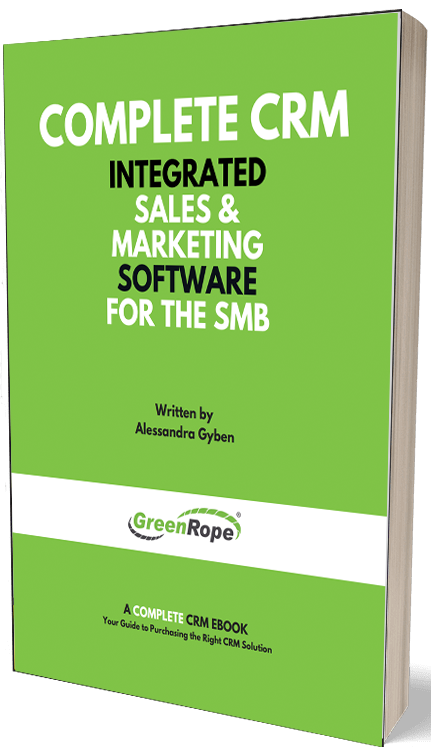 In addition to being able to follow your customers, a Complete CRM, like GreenRope can give you in-depth insights into who your customers are, how they engage with your brand, and predict how they will convert in the future. You won't have to waste any time playing guessing games. You can look at your customer profiles and see which clients purchase more, which campaigns they copme from and most importantly, how to keep customers for the long-haul. The platitude "time is money" isn't a platitude because it's wrong. It also happens to be true. Increased productivity happens when you have your data centralized into one complete database, where each department can easily and efficiently access the data they need to get the job done. When departments and teams are aligned they give the customer a smooth, thoughtful experience, from the first engagement, until after the transaction is complete and beyond. Your sales teams will be able to use customer profiles and tracking to create better strategies, while your customer care team can use the data in the CRM to determine how to provide the best service. Your customer is left feeling confident and satisfied with their interactions from start to finish, and you have increased sales, better customer satisfaction and employees that will work smarter, not harder. When you can track customer behavior, create profiles and see who your customers are, and increase productivity, you're able to generate more opportunities for sales and close more deals. A win-win for all.